This stunning, boutique hotel is situated in the Palmerie, a secluded Palm Grove 15 mins outside of the Medina. From the moment you arrive, you wont be able to resist entering a serene state of calm. The grounds are beautiful and impeccably kept, the service is homely but seamless and the amenities offer everything you could possibly wish for, and more. There is a hint of a Mediterranean feel here which only adds to the charm and elegance. They offer a shuttle service to the Medina three times a day should you wish to enter the madness of the souks (markets). This hotel is also a wonderful option to visit for the day if you decide to stay in a Riad and want to escape the hustle and bustle - they offer a day pass with access to the pool and the option to book a treatment at their in-house spa (we recommend a traditional hammam treatment). This charming Riad is set in a prime location for perusing the souks in the North of the Medina. It has a real homely feel to it, with very sweet and attentive staff. The Riad has only 8 rooms but feels surprisingly spacious - the rooms are very sizeable and consciously designed. The highlight has to be wonderful roof terrace which boasts views of the Atlas Mountains and the Riad itself is right next to the Ben Youseff mosque so you can’t miss the haunting call to pray throughout the day. The only set back is that it doesn’t have a pool - but you can choose to visit a hotel out of town like Les Deux Tours or The Beldi Country Club for the day so you get the best of both worlds. 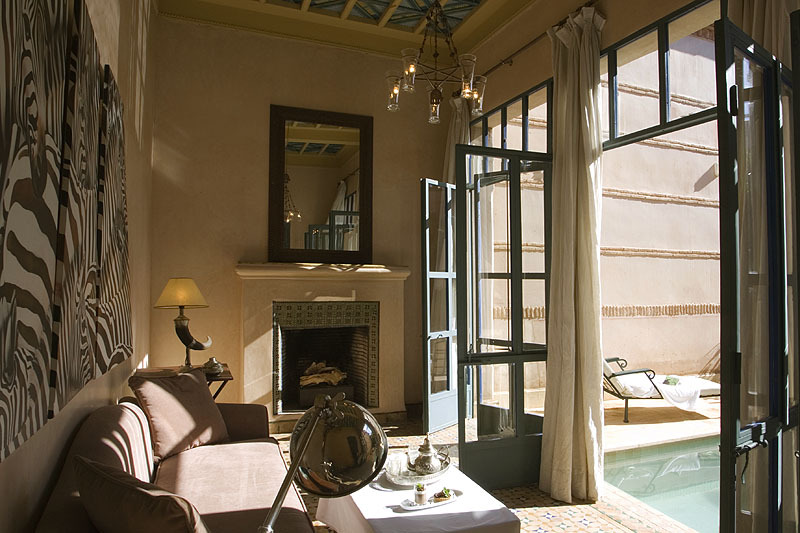 This sweet little Riad is perfect if you intend to be out and about soaking up the sites. It is located in the South of the Medina, but what we love, is the ease of navigation from the Riad to the centre of the Medina - just one straight market street. The rooms are cosy and comforting, the roof terrace is very cute and perfect to enjoy a leisurely breakfast or for a spot of sunbathing. Again, no pool here I’m afraid but its a great, reasonable option for those on a budget. Other recommendations that Hura hasn’t stayed at but come with excellent reviews…. This oasis ticks all the boxes: fantastic modern Moroccan cuisine, relaxed service and great atmosphere. We’re talking wicker lanterns, rooftop breeze and live acoustic music. A must-go. A gem of a restaurant with a pretty candlelit rooftop terrace. Perfect for a romantic dinner date. Traditional Moroccan cuisine at its best. You won’t find this cafe come restaurant in your normal travel books; it’s an unassuming little spot. A fabulous chilled place for lunch with the best homemade lemonade and falafel salad bowl. A welcome break from the typically crowded lunch spots. A white-washed little courtyard haven offering healthy French-inspired food. You have to book and they are only open for lunch but well worth a visit.